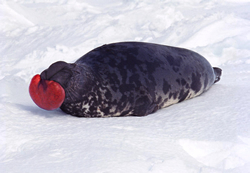 The Hooded Seal is a member of the family Phocidae and described as being "hooded" due to the large, red sack extending from its nose. In males, the sack expands like a balloon and resembles a ball. Hooded seals have a black face and a white or blue-gray coat of fur with black patches. Males are slightly larger and longer than females and are between eight and ten feet long. They can weigh up to 660 lbs while females usually reach around seven feet in length and weigh way less than the males (350 lbs on average). Hooded Seals have short but powerful limbs in relation to their bodies. The males inflate their expandable hood (called the nasal septum) intending to either attract females or scare away other males. Hooded Seals are known to swim deep in water (from 350 to 1,950 feet deep) to get their food. 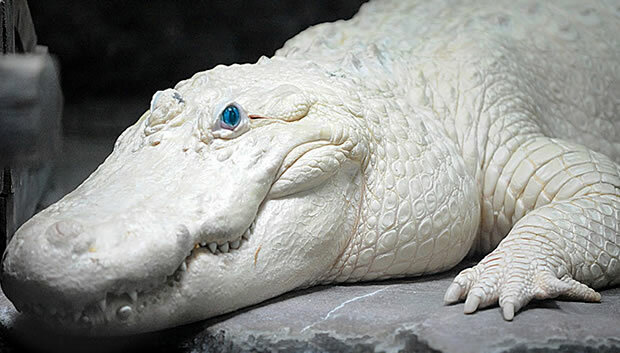 Their diet consists of crustaceans, fish and euphausiids, such as the Greenland halibut, cod, herring, red fish, squids, sea stars, mussels, shrimp, wolfish, and octopuses. Hooded Seals live in the Arctic ocean and on drifting ice packs and the deep waters of the North Atlantic. They prefer cold climates and are commonly known to be solitary. They are aggressive and territorial and are known to be highly migratory, traveling for long distances. They breed between the months of April and June after which they travel for long distances to feed. From June to August they join again in the ice to molt, separating again afterwards. Males are polygamous and attend to different families of females with their puppies each at a time. Females give birth to puppies that weigh about 99 lbs. Hooded Seals have suffered due to increased climatic changes in the Arctic Ocean and Northern Atlantic that cause the melting of ice in the region and at a relatively high rate. The seals depend on the ice for breeding. They are also threatened by oil spills, competition for food from other predators, and being caught in net fisheries among others. The different actions taken to conserve them include signing treaties and agreements and legal protection from harvesting and importing them. Little has been done to address climatic changes in their habitats. The current hooded seal population is estimated to be about 675,000 and is reducing yearly. Copyright Notice: This article is licensed under the GNU Free Documentation License. It uses material from the Wikipedia article "Hooded seal". Glenn, C. R. 2006. "Earth's Endangered Creatures - Hooded Seal Facts" (Online). Accessed 4/23/2019 at http://earthsendangered.com/profile.asp?sp=14399&ID=2. Need more Hooded Seal facts?